The last thing I remember before falling asleep last night was how toasty warm I was. The first thing I thought of this morning when I awoke was how cold it was and how annoying the sound of battery backup beeping is. The power went out at 2:00 am. My first order of business was to check the temps on the coolers and freezers. I decided the freezer items needed to be moved to a storage trailer outside so that they wouldn't thaw. So at 6:00 this morning I'm out shoveling the walk from the store to the trailer. Then I started fiddling with the padlock and was unable to open it. Robert to the rescue with his lock-thawing lighter. While he did that I started hauling boxes of frozen food out. After warming the lock and key Robert triumphantly announced he got the padlock off! At that moment the electricity popped back on. It was out for 5 1/2 hours. So Robert and I hauled all the boxes back in and put them in the freezer. It was a good workout. The roads are still closed and with no one in sight it was decided the store would close for the day. This is the 3rd day of road closures and windy snow. After lunch a group left to go look for the black wolf that was spotted by the road to Artist Point. Rob, one of the maintenance men, spotted it on his way here from Fishing Bridge. I like this snowy adventure but I'm beginning to think that I prefer a snowy adventure with electricity. I managed to upload a couple pictures this evening of the grizzly bear I saw by Obsidian Creek this morning. I'm sitting here looking out my window with a belly full of oatmeal raisin cookies watching it snow....and snow.....and snow. The only roads opened today for visitor travel was from West Yellowstone to Madison to Old Faithful.......and from Gardiner to Cooke City. It has snowed nonstop and the winds have been gusty. We are in another Winter Weather Advisory until 6:00 pm Friday with up to 12+ inches of snow forecast. Looking at some dwindling milk supplies in the EDR and realizing that with road closures and the extended forecast calling for snow it was decided that I would head into Gardiner this morning to pick up some items. I collected a list of needs from people and went out to my car. The cars in the parking lot looked like huge white turtles with the snow piled on and around them. Mark came and actually had to use a shovel to get the mounds of snow off my car and then compacted the huge hunks of snow behind it that was left from the 1 lane of plowing done through the parking lot. Using my driving abilities learned from driving Highway 10 across Minnesota to Fargo in the winter (anyone who has done this knows that sometimes nerves of steel are required) and with my handy All-Wheel Drive Equinox (finally getting a chance to try it out on real snow) I headed out from Canyon across to Norris then north to Mammoth. To be honest, I've driven in worse but I understand why the roads were closed to visitors. So I'm heading north and right by Obsidian Creek I see something brown approaching the road. It's a grizzly!! I came to a stop as it lumbered onto the road, headed right to the center line and then watched as it continued right down the middle of the road! Then it turned around came back toward me and stopped at a tree right outside my car window where it spent some time sniffing and scratching. Of course I was snapping photos the whole time, except for the moment I stopped to make sure I actually had my SD card in my camera (I did!). After awhile I decided I should move on and I moved forward about 40 feet when I saw in my mirror that the grizzly was on its hind feet scratching its back on the tree. I stopped and took a few photos of that, too. 3.3 million people come to Yellowstone with hopes of having that very experience - and here I was experiencing it quietly by myself from the safety of my vehicle. It was incredible and I will post the pictures on Sunday night. I made it to Mammoth and back to Canyon safely. On my way back I saw that the conditions were deteriorating. We had a total of 5 transactions all day, 2 of which were from the same park service employee who needed another Mt. Dew. I wonder what new adventures tomorrow will bring. Probably an adventure that involves snow. I recall doing some whining this winter because of the Winter Storm Warnings that never really showed themselves in Mammoth. You know what they say about paybacks. We have been in a Winter Weather Advisory since last night at 9:00 and I really didn't expect the amount of snow forecast and what we got was a whopper of a storm. I had spent the morning calling the Road Conditions Hotline for Yellowstone and each call progressed into more road closings. At this moment all roads in Yellowstone (except from Mammoth to Cooke City) have been closed to guests due to snow and blowing snow. The morning started off with about 3 inches on the ground and light flakes. Soon the electricity flashed off and on. Whew, made it through that one. Then it flashed off and on again. Whew, made it through another one. Then it went off.........and stayed off for over 5 hours. We spent much of the morning monitoring the cooler and freezer temps. and crating up packaged food from the cooler and hauling it to a location that was colder (a secure place outside). We watched the thermometer that reads outdoor and indoor temps. as they steadily fell. We started bundling up and watching the winds whip up the snow that was falling and already on the ground. With the roads closed we had exactly 3 customers, which were 1 LP gas delivery guy, 2 Xanterra employees and 1 park service employee. We can still sell merchandise without power but we have to hand write receipts and use 'kuncklebusters' for credit cards. We were told by one customer about hearing over his radio about an accident just north of the Norris campground involving 3 cars and a snowplow. There is a curve on that narrow stretch of road and with whiteout conditions and snow covering the road I can imagine how it happened. Power was out over much of the Park and even though power in Canyon came back on (thanks to an emergency generator that I hope holds up) Lake and Fishing Bridge are still without. YGS had some vendors and a set-up crew at Fishing Bridge and this afternoon a van pulled up with all the vendors in it from there. It took them an hour to travel from Fishing Bridge, across Hayden Valley and to Canyon after convincing a ranger that they were better off at Canyon than Fishing Bridge since we had food here. They came in and offered them donuts and coffee (from water heated on the gas stove) and we all expected that we would have numerous bodies laying under blankets on the floor overnight. 1/2 hour later the start-up crew made their trek across Hayden Valley and made it to Canyon. The vendors and start-up crew decided to caravan across to West Yellowstone. One of my employees decided to go to Lamar Valley today and he is now stuck for the night in Gardiner and one of the auditors is spending the night in Mammoth. The winds now have died down and the snow has stopped but there is snow forecasted for the next week or so. It is a beautiful sight outside but this goes to show how conditions can deteriorate rapidly. As long as the generator keeps on generating I will be happily warm. Dung & Dunger on Dirty Jobs!!!! Steve from Ardmore pulls through for me again and has forwarded me a wolf ringtone. Thanks Steve, I'm sure those around me when my phone goes off will appreciate your thoughtfulness. I have some HUGE news! My friends Victor and Dan from Dung & Dunger will be on the show Dirty Jobs!! Mike Rowe will be visiting and filming with them sometime in July!! Please check out their link that I have on this page. You may remember some pictures I posted of Connie and myself with them back in January when they came to Mammoth and a shot of Connie and I sporting our nifty Dung & Dunger t-shirts in the K-Bar in Gardiner. I am absolutely thrilled for them and I can't wait to see the show when it airs. I will keep everyone posted on that. I will also post their Yellowstone schedule so if anyone is in the Park at that time they can stop in at the store and take a look at their incredible bison dung artwork. Way to go Victor and Dan! I expect my Mike Rowe autograph by August. Now any news that I post this evening will be absolutely boring in comparison to that so I will sign off with the news that it is snowing (5 - 10 inches expected with 40 mph winds) and I'm doing my laundry. Maybe Mike Rowe would be interested in that?! Hello to Ken from Lafayette, LA who will be joining the Canyon General Store team next month! And another Hello to Pat D. from Thayne, WY (summer) and Pahrump, NV (winter) who's grandfather built the roads in Yellowstone and great-grandfather was a wagon master and Indian Scout. I bet there are some fascinating family stories there! Currently I sit about 35 miles and one construction zone away from a place I can upload pictures. Fortunately I have a managers meeting next Monday and Tuesday in West Yellowstone at the Holiday Inn (which happens to be owned by Delaware North which also owns the Yellowstone General Stores) where I can take advantage of some serious uploading. I should be use to the slow internet and the occasional cell phone glitches that happen around here but I still let out a grrr when the technology frustration monster rears its head. The good news is that I got my cell phone back and I at least feel halfway human again. Though I may not have signal at times and at many places in the Park there is some comfort that comes with that small silver piece of plastic and metal in my pocket. And when it rings it is music to my ears......literally. But my Ozzy Osborne singing Crazy Train ringtone just doesn't seem to have that Yellowstone feel so I've been thinking about changing it to something more along the lines of frogs croaking or birds singing. Besides my Ozzy ringtone has actually frightened small children. All Abooooaaaaard! I have been hearing tons of wildlife reports. Scarface, the local grizzly that charged Becky and Barney has been in the area, possibly the bear by the parking lot last weekend. Yesterday he was spotted across the from the riding stables south of Canyon. Today Robert and Wanda watched a grizzly on a carcass on Swan Lake Flat where the wolves came and chased it away. I took a trip up there after work and saw at least one wolf but no grizzly. Also, Mark saw a black bear by Tower and Andrea watched a black bear and 3 coyotes by Floating Island. Lake Everyone with days off in the next couple of days are planning their agendas and I'm sure there will be a few YGS employees driving by those areas. Along with my wolf sighting tonight I saw Big Boy, the Magnificent One and the Dorm Bison. There are a couple of ravens that like to hangout by the Adventure Store. Employees from previous years called one Edgar. Unfortunately they can be quite a nuisance. They like to walk around the patio area and beg food from the guests by showing off their mighty squawking voice. Some people enjoy the antics and unfortunately today I saw some enjoy it so much that they decided to toss it food to encourage it. I had to go out and kindly remind them that feeding the wildlife, including the birds, is not legal in the Park. Another animal that people like to feed are the coyotes. These clever little beasts will actually pretend to be injured by limping up to picnickers who will feel sorry for the coyote and toss it food only to be surprised when the coyote leaps on it and then runs away like an Olympic track and fielder. Animals habituated to human handouts almost always has a very sad ending for the animals and can create a very dangerous situation for the humans. Power Outage - During the Draft Pick! Greetings to Dan in Fredericksburg, Virginia and to my soul sister Maureen! Always great to hear from people that share the same interests (and same symptoms - ha ha - Maureen knows what I mean). And it was also nice to have sympathy showered my way from those who wrote to me about my card not being in my camera. It appears that David in California has on occasion forgotten his card so I don't feel so all alone in this department. So here I am completing week 2 of my adventure at the Adventure Store. I'm learning all sorts of new things. For instance, Becky taught me where the Stop button is on the printer. When I went to print something suddenly there was an onslaught of papers coming out of the thing and I'm standing there trying to grab them as they fell to the floor. Sure its cute and endearing when it happens in the movies to Meg Ryan or Sandra Bullock but when it happens to me I look kind of foolish. Today one of those 'Yellowstone' moments happened: we lost power. It happens on occasion here. Unfortunately this time it happened when most employees were watching the draft picks. It had been the topic all day and when everyone interested found their comfy spot around the tv to watch the power went off. I was upstairs at the time but I'm sure I could hear the groans from everyone echo through the building. We ate our dinner with the power off but it came back on after awhile and they all resumed watching the tv. Because of the power outages all park employees should have battery backup on their alarm clocks. The last major outage that I experienced was last fall when I made a tent out of my bed sheets in an attempt to stay warm. Aah, fond memories. I went to Mammoth yesterday where the grass and vegetation is greening up. It was a beautiful day in the high 60's. Even in Canyon it was gorgeous. Today it rained which eventually turned to snow. Nothing much but just enough to give a nice coating of white on the trees. And enough to remind all of us that winter isn't necessarily over yet. Yesterday I had to go to the employee RV park to read the meters (yup, meter reading is part of my job). I enjoy getting out and wandering around in the nice weather so this is one of my more favorite parts of the job. I park my car at one end of the road and wander up it reading the meters then cross over and wander back toward my car. It dawned on me when I was on the far end of the road that I was alone in the RV park and there has been a grizzly in the area. And there I find myself without bear spray and no one close enough to hear my screams. It's kind of an eerie feeling to be in that situation and one that I will not repeat especially after Becky reminded me that last year her and Barney had been charged by a grizzly in that very spot. I will carry my bear spray with me from now on. And talking about bear spray it seems that some of my co-workers have had some rough experiences with the stuff. One discharged hers in her car and another, with a group of people, decided to try out a couple cans of bear spray and they sprayed it into the wind. Needless to say they can all testify that it is some potent stuff. 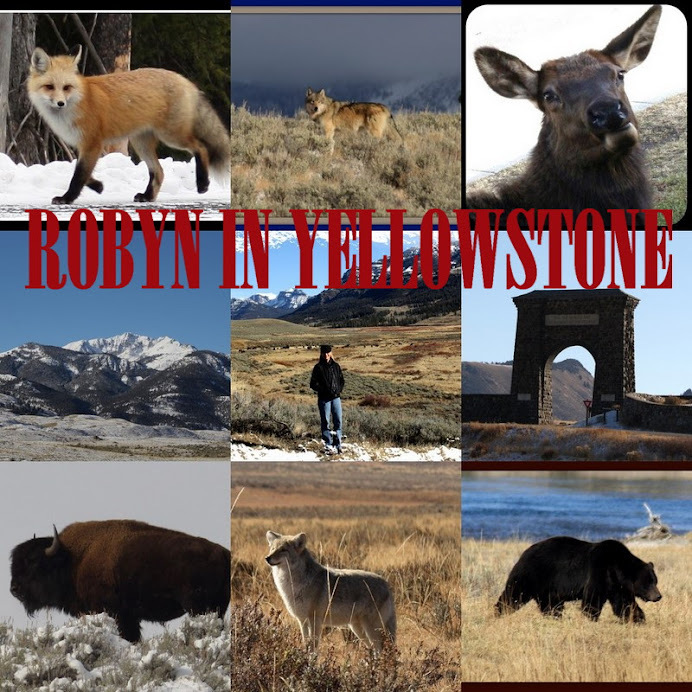 It's time once again to send out Yellowstone Greetings to Jonathan in Silver Spring, Maryland, Franz, Teri in Ogden, Utah, Todd in Gardners, Pennsylvania, Freda, Judy and Mary Ellen in Billings, Montana. I've been reduced this week by proclaiming my best friends to be a stack of Post It notes and the scratch paper that I carry around that I call Robyn's Brain. I've been filling my head with so much information that it is dribbling out my ears so I am constantly writing notes to myself. Without Robyn's Brain I am completely lost and my computer monitor has become a collection of misc. sticky yellow pieces of paper with notes scribbled on it. I've also been told that I now have that classic manager behavior: I talk to myself. Some of my Mammoth friends have stopped in to see me and it's good to know that I haven't been forgotten by my friends there. On Saturday a grizzly bear decided to stroll by the parking lot of Canyon Village. When someone came into the store and announced it the store automatically cleared of all guests as they swarmed down the parking lot with cameras in hand. I was gone at the time (a little R & R for me) but I hope that the people used their cars to go see it. I am now extra cautious when I go outside, especially after dark when I need to get something out of my car. This weekend I went over Sylvan Pass and out to Wapiti and Cody. I hadn't been over the pass since last October. Cody was beautiful on Sunday, it was almost 70 degrees. It was perfect weather to walk Patrick's puppy Buddy and......er, lose my cell phone. While walking by the Cody Reservoirs my phone apparently fell out of the truck but luckily for me a good Samaritan found it and turned it in to a local cell phone company who paged through my contacts and found one labeled Mom & Dad which they called. I'm glad it is was found though I was ready to smash it in frustration since there has been no cell service here for the past 4 days. On our way back from Cody I managed to snap a few pictures of 2 moose that were in the river. It was rather exciting since it has been quite a long time since I've seen a moose (Tetons in August). Later I took a few photos of a fox that was on the side of the road and then carefully maneuvered across the snow. What luck! Then when I got back I found my Sandisk in my computer.........not in my camera!! Which, of course, means I have exactly 0 pictures of the moose and fox. I need to stick a Post It note to my camera reminding me to put my disc back in it from now on. I have received quite a few letters from people commenting on how much they would love to be in Yellowstone living and working....or at least for an extended visit. I am very lucky to live and work here and to have the opportunity to experience and see all that I do . I 'live' Yellowstone everyday and I try to never take it for granted. I wish that everyone could be and do what they love. And in my thrilling and exciting Yellowstone life I mopped the floor today. Yup, even here the mundane can creep in. But the whole time I was mopping I was thinking about the Adventure Store opening for the season tomorrow afternoon at 1:00. So that newly mopped floor of mine does have some excitement for me. Guests will come through that door this weekend with fun and fascinating stories, dreams of seeing a grizzly, eyes as big a saucers as they talk about the bison in the road, and memories of their trip to Yellowstone. Besides my memory of floor mopping on April 15 I will also remember this day as the one where I saw my second grizzly bear for 2010. I went for my Hayden Valley drive after dinner and spotted a small brown dot across the river by a small thermal feature on the south side of Hayden. It was too small to be a bison and from how it moved I knew I was looking at a grizzly. I didn't have my binoculars with so I looked through my lens of my camera and confirmed I was indeed looking at a grizzly. Robert, Wanda, Jay and Cassandra had left behind me so after watching for awhile I turned around and met them at a pullout and brought them back to the area so they too could see him. On my return to Canyon I stopped to watch a coyote cross the road in front of me and then open his mouth for a wide yawn. I guess it was one busy day for that little coyote, too. Getting the store ready for Friday's opening is a big job. The store needs to be cleaned and polished, new apparel items need to be hung up and put away, gifts will be coming and lots of paperwork to prepared. At times it can be glorious chaos and sometimes it is just roll-up-your- sleeves hard work. But there is one fabulous Adventures crew coming together and working hard. I also found that the Magnificent 7 was amassing once again. Currently it is only the Magnificent 4. I found them by Roaring Mountain with three of them standing in the road refusing to move with just enough distance between them for me to maneuver around them. I noticed that the skies to the east of me seemed to be filled with snow. I decided to turn back which was a good call on my part. Half way between Norris and Canyon the snow really started to come down and all I could see through my windshield was little blasts of white coming straight toward me. With about 10 feet of visibility I really had to come to a crawl and prayed that there was no bison in the road......or bears. I made it back to Canyon where I could finally enjoy the sight of falling snow. I better get the shovels ready. This blog posting comes to you straight from Canyon! I finally made it here. There are just a handful of people in the Village at this time but tomorrow more will be pouring into the store to start their own Yellowstone adventure. Check in was at West Yellowstone Friday morning between 8:00 and 10:00. I was at Lake and decided to be on the cautious side and head toward West Yellowstone before 7:30. Hayden Valley was drifted over with only 1 set of tire prints heading north through some rather icy snow that at one time had been slush. Lots of maneuvering and watching the posts on either side of the road to make sure I was still on the road. I made it through and saw that a plow was heading that direction from Canyon. I hit the road construction and had a bit of delay there. Leaving early was paying off. When I turned to drive along the Madison River on way to West Yellowstone I slowed down for 1..........2........3.........4 herds of bison. Whew, made it through that. Then as I was approaching the bridge over the Madison River I came across the mother of all bison herds slowly making their way down the road in the same direction I was heading. I didn't make it to West Yellowstone until 2 1/2 hours after departing, all the time facing pretty much everything that an April day in Yellowstone can throw at you. After a morning and early afternoon of meetings I, along with 3 employees, finally made it to the Adventure Store. I faced the unpleasant task of unloading and unpacking my boxes. It took 2 trips from Mammoth to move my belongings here and 2 days of casual unpacking. This evening I took a trip into Hayden (the roads are now plowed to pavement with only a few drifts coming onto the road - don't know how long that will last). There were only a few bison in the distance and not another single soul in the entire valley - just me. I used a pull out to just sit and look at what I consider some of the most impressive views. I also looked to see if any grizzlies were by the treeline but none were to be seen. Connie saw a grizzly by Fishing Bridge yesterday. Tonight the sky is clear, the stars are twinkling and I can hear a slight roar from the Lower Falls. It's all coming back to me. On Friday as I was heading down to Lake this is what greeted me on Swan Lake Flats. It was white-out conditions which caused me concern as to what I was going to find at Hayden Valley. The worry was for nothing as the roads were mostly clear even though the wind was blowing. There were a few snowdrifts on the road to maneuver around but it was not as bad as I had anticipated. Not far after the Flats I watched a coyote fighting off the wind. The picture does not show it well but his fur was really moving with the wind. A herd of bison were wandering around the thermal features by Mud Volcano. After a few days of snow and wind Hayden Valley was thick with white on Sunday. There were only a couple lone bison that I could see. They were either laying in the snow or just standing. I watched this one for awhile as a bald eagle flew overhead. Dragon's Mouth was puffing up it's steamy vapors. View of Hayden Valley after snow. The Yellowstone River and a thermal feature. It was a beautiful sight. The snowdrifts in Hayden Valley were getting rather high. Luckily the wind had calmed and the snow had stopped so driving on Sunday was much easier. Right after I took this picture a snowplow came around the corner - just 1 of 3 vehicles that I saw the entire 50 mile trip back to Mammoth. I currently have all my stuff packed into boxes ready to be hauled down to Canyon. I made a few stops in Gardiner to finish up some business and then I will be on my way this afternoon. Yesterday a few of my Mammoth friends stopped in the store to say goodbye with promises of stopping in at the Adventure Store to see me this summer. I didn't realize how many people I have come to know in Mammoth and it was certainly a bittersweet day. The YGS in Mammoth on March 30 during a snowfall. Bison walking along the road next to the Madison River on the way to West Yellowstone. Luckily the herd was next to a large pullout so we could drive into that and around the herd. This a picture of Old Faithful not erupting. It was taken March 27. It certainly would have made a much more interesting picture if it was erupting but after waiting 40 minutes it was time to move on. I was in the interior yet again this past weekend. There was lots of snow and wind and even a power outage (which thankfully was corrected right before my arrival). I took pictures along my route which hopefully I can post tomorrow morning.